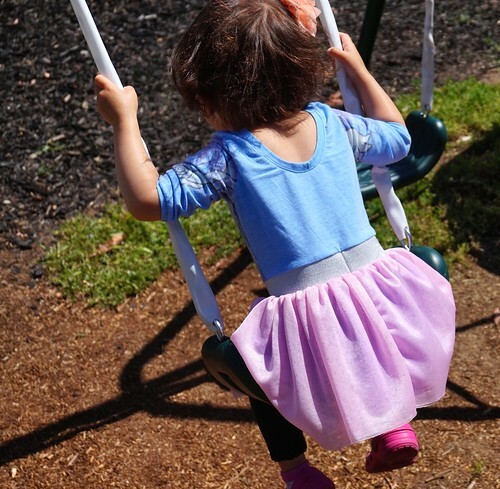 Recently my little one has been exploding with preferences that are just her own and not influenced by her sister. 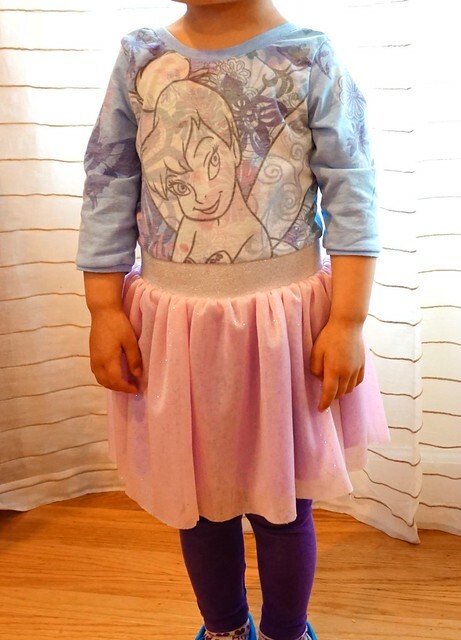 One of these is her sudden love of Tinkerbell and all things fairies. Being the overzealous mom that I am, I knew I had to make her something with Tinkerbell immediately! There are many super adorable Tinkerbell costumes out there, which I think I’ll make one at some point, but for a Disneyland dress, I decided to keep it very simple. 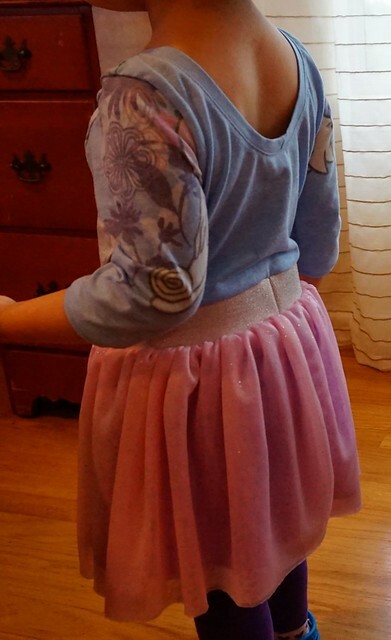 I had a Tinkerbell shirt that I was given to upcycle for the girls, and I thought a ballerina dress would be perfect! I was inspired by some that I saw at the Disney store and figured I could make one easily using my stash. 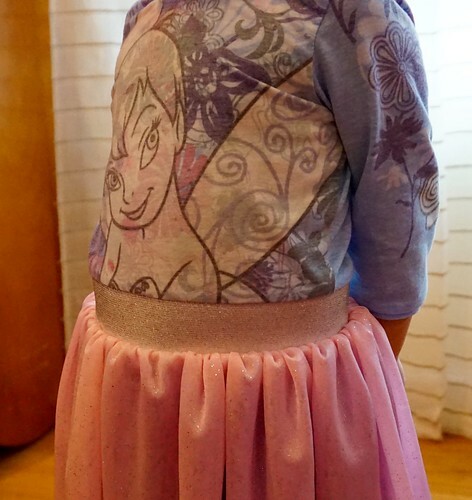 I decided to use the Little Miss Ruby Tuesday dress pattern by 1 Puddle Lane to upcycle the shirt. I really love all of the options this dress pattern comes with. I ended up choosing the high front, back scoop neckline, and 3/4 length sleeves in size 18 months. 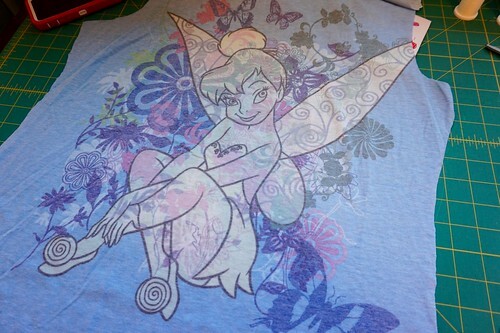 I was able to fit most of the pattern pieces on the front side of the T-shirt, so there’s Tinkerbell design on the sleeves too. For the skirt portion, I had this great metallic waistband elastic I was saving. 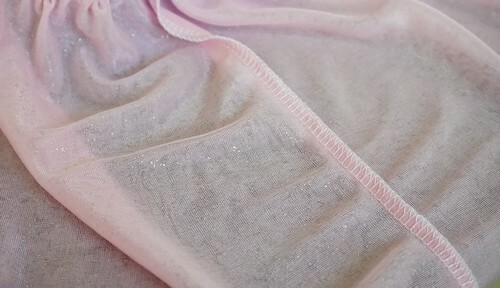 I also had some leftover charmeuse for the skirt lining and some pink sparkly tulle. To get my skirt piece sizes, I tried the top portion on my girl to see where it ended, then I measured from where it ended to where I wanted the skirt to fall, which was her knees. I had to add all of the seam allowances (I used 1/4″) to my measurements. I also decided to have the tulle fall 1 1/2″ past the underskirt. 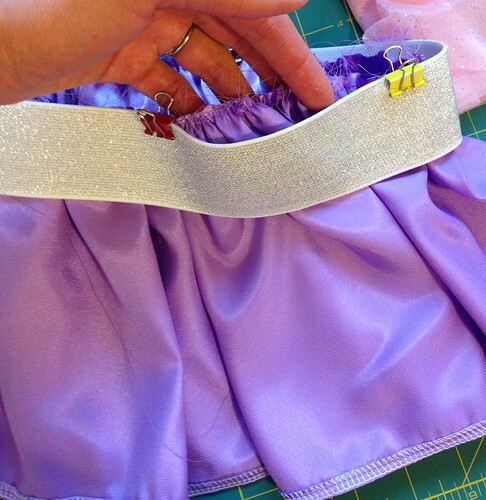 To cut the elastic, I measured her waist then added 1″ for a 1/2″ seam allowance, which gave me a measurement of 20″. I placed the elastic ends right sides together and sewed a straight stitch back and forth a few times. I opened up the seam allowance to keep it flat to reduce bulk. 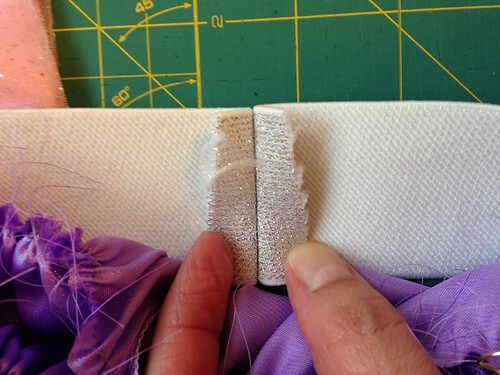 Keep in mind, the front side of the elastic is a little scratchy, so if your little one is sensitive, you can reduce the 1/2″ seam allowance by serging it to 1/4″. The serged seam seems to diminish the scratchiness. Then I cut the charmeuse skirt lining 7 1/2″ long by width of fabric. I sewed the short ends right sides together, then serged the seam. I also serged the bottom hem, flipped it up and top stitched. The top I gathered using a basting stitch. I cut 2 pieces of the tulle 9″ long by width of fabric. I just held these together as one “double” piece of fabric when sewing. I simply serged them right sides together along the short ends (feeling lazy). I also gathered them using a basting stitch and left the hem unfinished. The method I used to attach the skirt pieces to the elastic I picked up from studying a skirt at the store. I liked the way it “poofed” out. Basically the lining is attached to one side of the elastic and the tulle to the other. First, place the skirt lining wrong side out inside the elastic, right side out, matching top edges and seams. 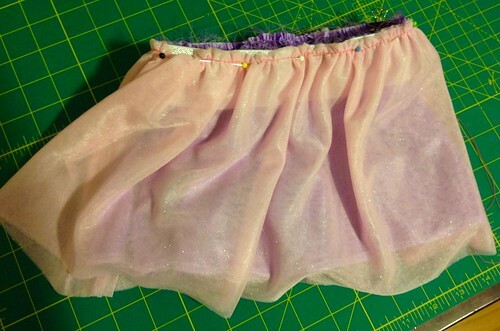 Then place sparkly tulle wrong side out over elastic, matching top edges and seams. It makes an elastic sandwich. Now serge or zigzag stitch all the way around the top edge, making sure to keep all of the fabric within the 1/4″ seam allowance. With all those slippery gathers, it’s easy for them to sneak out! I added the top portion to the elastic last by placing them right sides together and matching the edges. 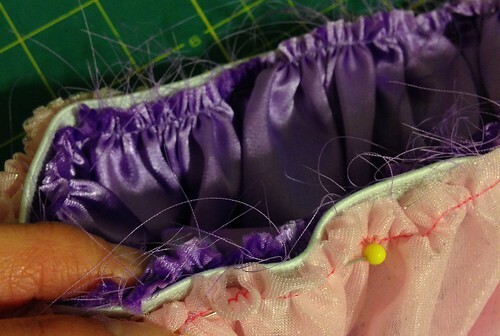 Make sure the elastic seam is in the center back of the top. Then when you flip it out, it looks like a dress! Done! It’s actually pretty quick and easy. What do you think of the elastic/ skirt construction? I haven’t seen this method before, so it’s new to me. If you try it, let me know what you think.